The unique mounting bracket holds a half ounce oz. pepper spray bottle with the hottest pepper formula on the market today. The Cycle Saver's pepper spray, extracted from cayenne peppers, creates an intense burning sensation on the eyes, skin and throat and can cause an attacker's senses to temporarily shut down and give you time to get away. Cycle Saver's easy-twist lock top and snap in mounting bracket allow for easy accessibility and the ballistic stream can spray attackers from up to ten feet away in as many as 10-20 short bursts to keep you at a safe distance. This is one bike accessory that's a must for any casual or professional rider. Be in control and prepared for any incident with a Cycle Saver by buying pepper spray from our store! Mounts on small and large diameter handlebars or seat post. 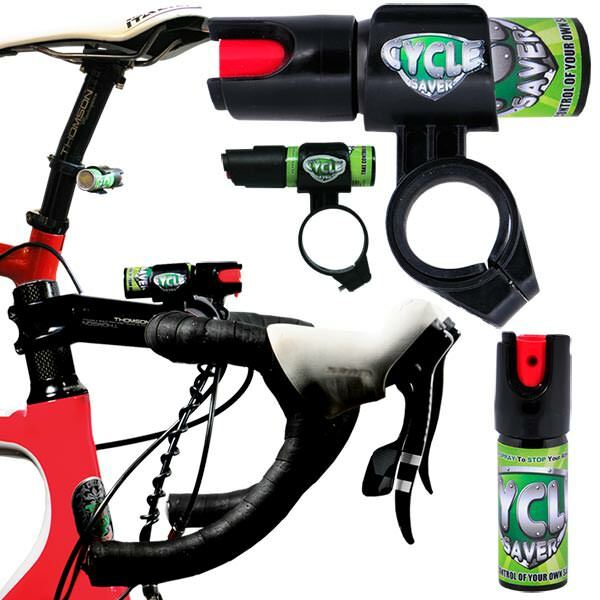 Cycle Saver pepper spray for bikes, handlebars and seat posts.